During the financial year that closed in June 2018, Cyara added several seven-figure annual contracts to its customer roster. With customer expectations ever increasing, brands must differentiate themselves through great customer experiences. Cyara continues to lead the industry in CX assurance innovation. 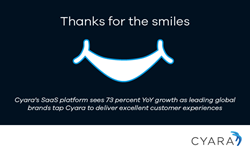 Cyara, provider of the leading customer experience (CX) assurance platform, closed its 2018 fiscal year ending June 30 with 73-percent growth in new SaaS bookings and customer retention exceeding 97 percent. The continued growth in sales revenues was fueled by both new contracts and renewals with brands that include 1300 FLOWERS, 7.ai, GoDaddy, HomeServe, and Nelnet. As the world’s leading CX Assurance platform provider, Cyara accelerates the delivery of flawless customer journeys across digital and voice channels while reducing the risk of customer-facing defects. Every day, the most recognizable brands in the world trust the Cyara Platform to deliver customer smiles at scale. For more information, please visit http://www.cyara.com. Cyara continues to lead the industry in CX assurance innovation.